BEAUTIFULLY UPDATED and only a five minute walk to DELIGHTFUL DOWNTOWN DUNEDIN. OWNER FINANCING IS AVAILABLE on this great home with many nice features: OPEN FLOOR PLAN. 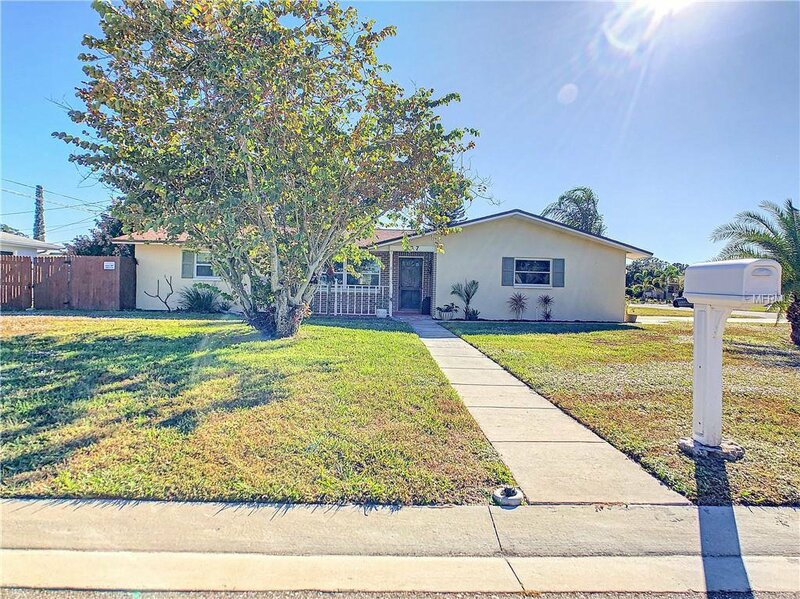 BRAND NEW ROOF Aug. 2018, UPDATED KITCHEN with solid wood cabinets and custom features, GRANITE counters, breakfast bar, STAINLESS STEEL appliances, WOOD BURNING FIREPLACE in Florida room, most windows upgraded to white vinyl DOUBLE PANE, two wall mounted FLAT SCREEN TVs convey with sale. There is an inviting SUN ROOM that you will love to spend time in. INSIDE LAUNDRY, upgraded laminate flooring, fenced back yard on corner lot with plenty of room for your boat, trailer or RV on the side of the house. A portion of the garage has been converted to create a 9X12' office, art studio or third bedroom. The garage is still deep enough to house two compact cars or golf carts. Irrigation system covers front and side yards and is on reclaimed water. This is a very functional and inviting floor plan. Best of all, it's in Dunedin with great dining, shopping, family oriented special events and close to world famous beaches. Walking distance to San Jose elementary school. No HOA fees or deed restrictions. Nice furnishings are also available separately. Room sizes are rounded-buyer to verify exact measurements. SELLER IS PREPARED TO RESTORE THE GARAGE TO FULL SIZE WITH ACCEPTABLE OFFER. Listing courtesy of ACTION PRO REALTY. Selling Office: RE/MAX ELITE REALTY.